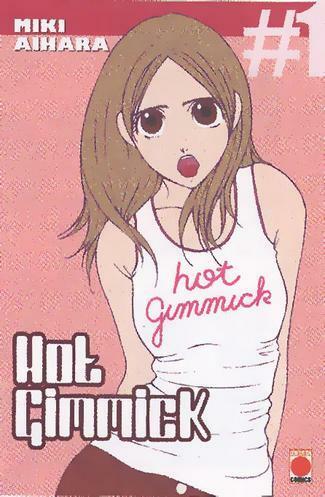 Sinopsis: Hot Gimmick es la historia de una estudiante llamada Hatsumi que vive con su familia (hermano mayor, hermana pequena, hermanito, papa y mama) en un edificio de apartamentos perteneciente a la empresa en la que su padre trabaja. Este tipo de edificios son construidos por compañias para dar a sus empleados una vivienda cercana al trabajo, y son por supuesto una sociedad en si mismos. La reina del complejo es la señora Tachibana, cuyo hijo, Ryouki Tachibana, Hatsumi recuerda como su horrible torturador cuando ambos eran pequeños. La otra cosa que Hatsumi recuerda, es a cierto Azusa, muchachito encantador que solia salvarla del horrible Ryouki. Los dos desaparecieron de su vida y ahora, varios años despues, deciden reaparecer para recordarle que cuando el dia a dia no es demasiado esperanzador, siempre hay algo que puede hacerlo todavia peor. take a lot of work? I've virtually no knowledge of coding but I was hoping to start my own blog in the near future. Anyhow, if you have any suggestions or tips for new blog owners please share. I know this is off topic however I simply wanted to ask. Cheers! things out. I like what I see so now i'm following you. Look forward to going over your web page repeatedly. site around therefore i found check it out. I’m absolutely loving the information. Superb web log and great style and design. I enjoy the knowledge you present here and can’t wait to take a look when I go back home. I’m taken aback at how fast your website loaded on my cell phone. I'm extremely inspired with your writing talents and also with the structure for your blog. Is this a paid topic or did you modify it your self? Either way keep up the excellent high quality writing, it is uncommon to see a great weblog like this one these days.. It's remarkable to pay a quick visit this website and reading the views of all mates regarding this post, while I am also eager of getting experience. I read this post completely on the topic of the resemblance of most up-to-date and previous technologies, it's amazing article. your online page over and over repeatedly. log once you could possibly be giving us something enlightening to learn? blog loaded on my cellular phone. I’m not really using WIFI, just 3G. this put up used to be great. I do not recognise who you might be but definitely you are going to a famous blogger for those who aren't already. Cheers! I'm extremely inspired with your writing talents as neatly as with the layout in your blog. Is that this a paid theme or did you modify it your self? Either way keep up the excellent quality writing, it is uncommon to see a nice blog like this one these days..
encountering problems with your RSS. I don't understand the reason why I am unable to join it. Is there anybody else having the same RSS issues? Anyone that knows the solution will you kindly respond? Thanks!! Hello just desired to give you a brief heads up and let you know a number of the images aren’t loading correctly. I’m not sure why but I believe its a linking issue. After looking into a few of the blog articles on your website, I seriously like your way of writing a blog. Hi! Can you use Twitter? I’d want to follow you if that would be ok.
I’m positively enjoying your site and appearance forward to new updates. Fantastic items from you, man. I've be aware your stuff prior to and you are simply too fantastic. I actually like what you've bought here, really like what you're saying and the way in which during which you assert it. You make it entertaining and you continue to take care of to stay it smart. I can not wait to read far more from you. This is really a tremendous web site. Quality posts is the secret to be a focus for the visitors to go to see the site, that's what this web page is providing. would ike to know if that is happening to them aswell? What's up, I log on to your blog on a regular basis. Your humoristic style is awesome, keep it up! Hello! Would you mind easily share your blog with my twitter group? where I will get responses from other experienced people who share the same interest. If you have any guidelines, please i'd like to know. Kudos!